For use on electric and cordless impact drills. Carbide tipped jaw capacity 1.5 - 13mm. 1/2" x 20 .. Ideal for getting into tight places 10mm keyless chuck Ball bearing shaft support 3/8"-24 UNF spi.. Fits onto the end of a drill bit and when drilling a hole will collect the dust created. Suitable f.. Compatible with most standard power drills Pumps up to 1500 ltr/hour & up to 10m horizontally Acce..
Milwaukee SDS chuck to suit the following. PLH30XE PLH32XE PPH26XE PLH30XE PLH30QEX.. Overall Length 1.1mt (44") 6mm Keyless Chuck Anti Kink Shaft Hex Shaft Size 6mm Maximum 6000rpm..
Converts 1/4" hex female drive to 3 jaw chuck..
Keyless chuck that can be used in quick chucks and impact drivers to hold parallel shank drills bits.. 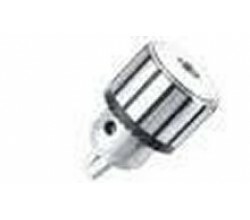 The pin chuck is a useful accessory for holding drills too small to be held by standard capacity dri..
3/8" Keyless Chuck One to one ratio Includes 10mm keyless chuck and a useful two position side han..